Tunefish 4 was developed as a smaller replacement of Tunefish 3 with roughly the same power, it is however not compatible and uses different synthesis algorithms. It was developed for the 64k intro "Turtles all the way down" by demoscene group Brain Control and is available as VST/AU. Improved UI compared to TF3 which will visualize all modulations. 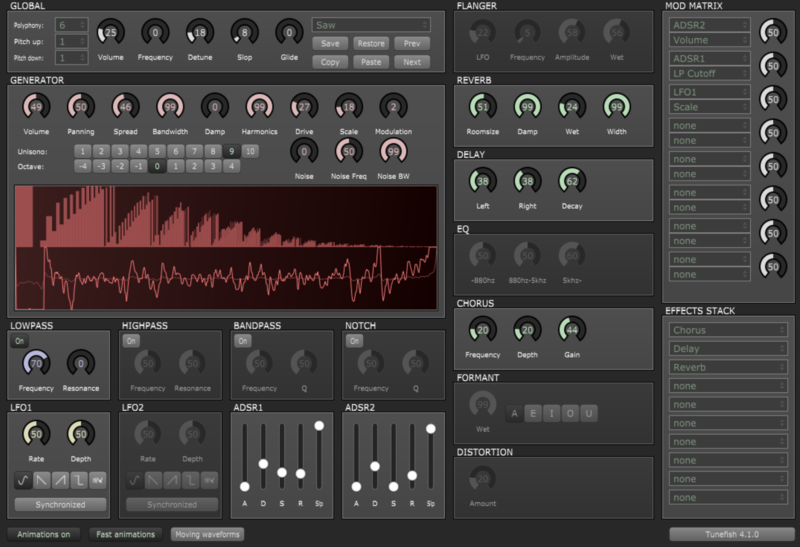 Uses an additive synthesis based wavetable generator. The Noise generator can produce any frequency of noise with any bandwidth. Lowpass, Highpass, Bandpass and an improved Notch filter are available. 2 ADSRs and 2 LFOs that can be linked to pretty much any important knob using a modulation matrix. Supported effects are Flanger, Chorus, Distortion, Delay, Reverb, EQ and Formant. The effects stack allows for any permutation of up to 10 effects. Thanks a lot to Brain Control for creating the nice little free analog soft synth Tunefish 4.2. I have created some patches for the synth version 4.2 and I will upload the new patch files to this page. Last update: May 17. 2018. I will also have a list of the files, so you can find and download them, one by one. Here is the list as a web page. If you want to download all the current files(24) download this. all patches (zip) Checked by Panda GOLD Protection Anti-virus. You can add a new patch to your Tunefish synth without loosing old patches like this. 1. Download the file that you want from my page. 3. Save the file in your patch folder, replacing the old file. Now you can load and modify it like any other file. If you want a smart tool for changing the patch names, I think this can help you. Info on how to find the user patches, see below. GitHub is a developers homepage and here you can get more in depth information about the work on Tunefish like day-to-day updates. KVR audio Here you can download the Tunefish v4 synth and in the forum you can find some patches if you log in. Payne Music Here you can hear the Tunefish v4 synth in action. KVR audio Here you can download the Tunefish v3 synth. Spike by Cognitone An extended version of virtual analog synth Tunefish4. Old patches still work in this update, but bug fixes and new features makes it interesting. Download ready to use programs here. ALODK patches and links This page... I will update the links and link to all the new patches I make and find from time to time. VST4Free Here you can download the synth. Plugin Boutique Here you can download the synth. Reverb Here you can download the synth. Bedroom-producers Here you can read a bit, see the demo and download a BETA version of the synth. AUR Linux archive A Git fork of Tunefish 4.1 "An additive wavetable-based synthesizer VST plugin"
Linux: Copy the tunefish4.so to ~/.vst folder (which you might have to create). Windows: You can typically choose where to put the plugin and point your DAW to this folder. or /Library/Audio/Plug-Ins/VST for the VST.